I found these on another site without attribution. If you know whose work they are, I'd love to give them proper credit. The draft of my second novel, a sequel to Simon Says, is almost finished. At the end of book one, Simon has proposed and Sadie has accepted. The engagement party is barely over when Sadie tells Simon she doesn't think she can marry him. She's looking for reassurance, of course, and Simon knows just the way to win her back. Corner time is a dreaded part of domestic discipline. It's kind to let a poor girl sit down, if she can. What is your Easter tradition? In the Czech Republic and Slovakia a very odd tradition takes place on Easter Monday. 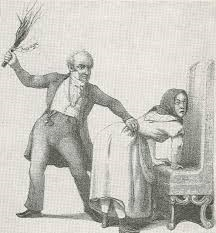 The day, known as ‘flogging Monday’ or Dyngus, begins when young men visit their female friends and whip their butts with sapling branches. The whip, known as a Pomlázka, is a selection of fresh pussywillow branches with coloured ribbons attached at one end. The Pomlazka symbolises fertility. Considered as part of a traditional courting ritual the young men demand treats and vodka before they whip the girls. In some regions it is even customary to douse the girls in cold water too. Oh Eastern Europe, maybe go easy on the vodka? In book two of the Simon Says series, Simon demands that Sadie ask for a spanking she has more than earned. Will she ask him? And how? Maybe she'll phone it in. One hundred strokes a night would make the naughtiest woman rethink her behaviour. Thanks to the Red Rump site for this great old advertisement. http://redrump.blogspot.ca/ Although that site is more about women giving spankings than receiving them. In my book, Simon Says, Simon uses a switch on Sadie in the woods. Research tells me this is a very painful way for a girl to take her medicine. I'd call this design a work of art, wouldn't you? This image must be from the 1950's or 60's. Have you seen it before? Any idea of its history? I didn't see this cover of the September 1975 issue of National Lampoon (I believe the artist was Bernie Lettick). When my boyfriend Gavin sent it to me in the form of a greeting card, almost ten years later, I knew he was the one for me. Over twenty-five years later he still knows how to warm my...uh...heart.